Spend Super Bowl Sunday with Family, Friends, and Food! Celebrate Super Bowl LIII the right way with a delicious spread and your family and friends at your Anthem House apartment.  Check out how you can make the most of the biggest sporting event of the year with local Baltimore restaurants and recipe ideas! Whip up a savory Roasted Garlic and Bacon Spinach Dip from a recipe by Sally of Sally’s Baking Addiction, a Maryland resident! This appetizer is a great addition to a spread of pickings for your guests. 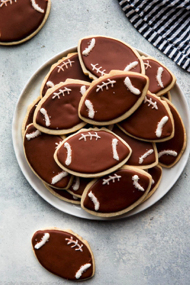 Whip up some football sugar cookies for dessert! Check out her full list of “12 Super Easy Super Bowl Recipes” for more ideas to add to your kitchen table this Sunday, such as guacamole, pepperoni pizza rolls, loaded sweet potato skins, and more. If you’re feeling ambitious, check out @baltimorehomecook’s Instagram for tips and tricks on pasta-making! She is a culinary student, attorney, and a pasta instructor! Check out her culinary creations to draw inspiration into your own kitchen. 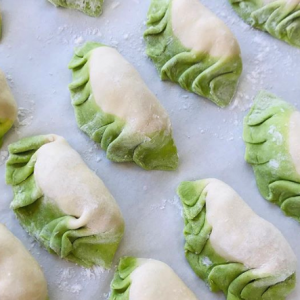 Her pork gyoza would be a great addition to any kitchen this Super Bowl Sunday. Don’t feel like cooking? These local restaurants have got you covered! Our neighbors at Rye Street Tavern are serving up a Super Bowl to-go package that can feed 4-8 guests! 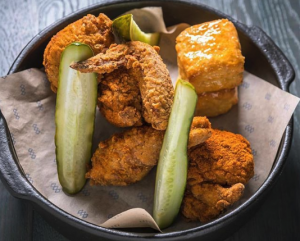 Your guests can enjoy a 16-piece fried chicken bucket, honey butter biscuits, two sides, cornbread, and a freshly baked pie for $150, but Anthem House residents can score this package for only $120! You’ll be winning big with this special 20% discount and your guests will be filled, fed, and ready to watch the game. Call Rye Street Tavern at 443.662.8000 and mention you’re an Anthem House resident to reserve your package for game day. Grab some eats from Amber Cafe, right in our building! 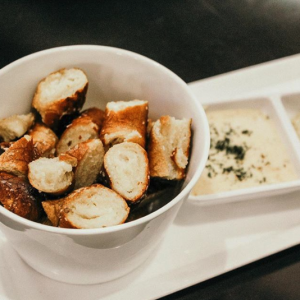 Their menu offers great Super Bowl apps such as deviled eggs, meatballs, pretzel pieces, and more! What would a Super Bowl Sunday be without chicken wings? 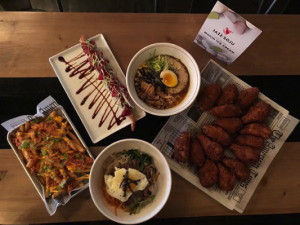 Check out Jazz + Soju for their famous Korean fried chicken wings. Want something lighter? Their sushi rolls are a great option! 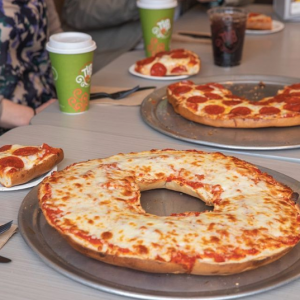 You’ll want to cross the pond to pick up this XL pizza bagel from THB Canton! It’s $29.99, serves 16, and is only available for the Super Bowl. Call THB Canton at 410.732.9090 and pre-order yours today! 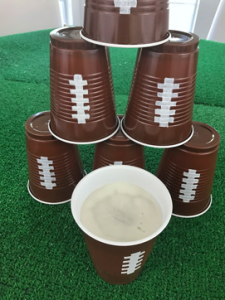 Decorate brown plastic cups with white Sharpie markers to draw on the laces of a football! Liven up your guests’ drinks with this small finishing touch and immerse them in an athletic atmosphere. Bump some feel-good tunes to keep spirits high before, during, and after the game with a Super Bowl LII playlist on Spotify! We hope you make the most of your Super Bowl Sunday party! Share pictures with us at @AnthemHouseApts so we can see how you #LiveYourAnthem and tell us who you’re rooting for in Super Bowl LII!